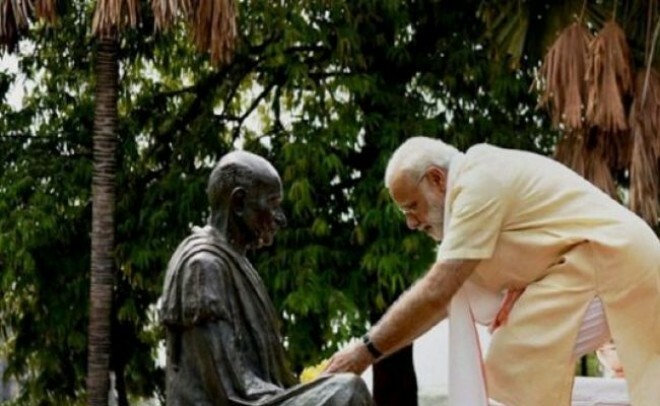 New Delhi, Mar 12: On the 89th anniversary of the historic Dandi March led by Mahatma Gandhi, Prime Minister Narendra Modi on Tuesday took a jibe at the Congress, saying, "Its culture is the anti-thesis of Gandhian values." He quoted the works of Mahatma Gandhi to claim that Congress stands for everything that the Father of the Nation did not like -- casteism, corruption, communalism and dynastic politics. The Prime Minister in his blog titled, "When a handful of salt shook an Empire!" said, "Gandhiji taught us to think of the plight of the poorest person we have seen and think about how our work impacts that person. I am proud to say that in all aspects of our Government's work, the guiding consideration is to see how it will alleviate poverty and bring prosperity. Sadly, the anti-thesis of Gandhian thought is the Congress culture." He also accused Congress of creating caste divisions and practising inequality in the country while in power.